This research suggests that socially isolated individuals would be more receptive to the idea of living only for oneself. This could mean one of two things when related to Objectivism: (1) it could mean that Objectivism would appeal to social isolated individuals; and (2) that Objectivism has a built-in incentive to make people social isolated, since this will increase the chances that this individuals will accept and remain true to the Randian creed. Let's first examine the appeal that Objectivism might have to the socially isolated. One issue that Objectivists tend to be naive about is the degree to which ideologies are, in a sense, self-selecting. That is to say, people tend to choose ideologies, not because of the acceptance of some premise or the logic of some argument, but because that ideology appeals to their needs, desires, and/or weaknesses. 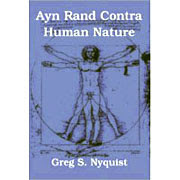 Generally speaking (there may be exceptions), people don't become Objectivists because they are convinced by Rand's premises or arguments; rather, there is something they find emotionally appealing in Objectivism, which leads them later to adopt a speculative allegiance to Rand's premises. Rand's philosophy strikes them as true and enlightening, despite the absence of sound argument and compelling evidence. ...whether we are fair [to others] and pay back our debts stems more from automatic feelings than from reason. We can always justify why we don't have to pay back just yet, but we can't help feeling grateful. More important, we are wired in such a way that our gratitude can be misdirected, leading us to repay our debts to the wrong person. The danger of this, of course, is that if we're feeling grateful, we're liable to help anyone who requests it. In fact, it an be quite adaptive if it doesn't happen too often, as it encourages people to take the chance on a stranger with whom they might end up having a mutually beneficial relationship. In short, it's kind of like paying it forward, driven by emotion. Still, this fact also makes us vulnerable to ploys of others. Think about it. When is the best time to ask someone for a favor or for money? When they're feeling grateful (even if it's to someone else). Ever wonder why sometimes those charities asking for donations stick a dollar in the envelope or give you a "gift" of stamps or stickers that you never asked for? As the results of our experiments suggest, these tactics work. So the next time you're feeling grateful and you're tempted to do someone a favor, take a minute to stop and think about whether or not the person asking you for the favor is someone who really deserves it. Although Rand may have been very concerned with how feelings of obligation might be exploited by individuals to manipulate others, her orientation is so driven by narrow ideological concerns that she misses all the important nuances of the situation. Moreover, her denial of innate propensities causes her to naively believe that most important social problems can be solved (or at least severely mitigated) by persuading individuals to accept rational premises. But since these innate propensities do in fact exist and do in fact exercise an influence on many, if not most, individuals, trying to resolve or cure them by propagating so-called "rational" premises is a waste of time. Innate propensities cannot be managed wisely if one refuses to acknowledge their existence. Objectivist Virtues and Compassion. The six primary Objectivist virtues are: rationality, honesty, integrity, productivity, pride, and justice. What is perhaps most interesting about this list is not the virtues that are included but those that are omitted. There is nothing about compassion, kindness, empathy, consideration for others, avoidance of cruelty, charity, good manners, etiquette or any of the so-called "social" virtues. This is not to suggest that Rand was opposed to these virtues, or regarded them as vices. She regarded charity, for example, as a "minor" virtue, and she was always eager to insist that altruism could not be equated with consideration for others. However, it is clear that these social virtues are not at the center of the Objectivist ethics, but are regarded by that system as lesser virtues which, when used as a facade for altruism, can easily become vicious. Among the many things this research suggests is that there exists within most human beings innate propensities in conflict with acquired propensities. In above example, the innate propensity involves a preference for people "like us," while the acquired propensity involves the belief that we shouldn't prefer individuals who are like us to individuals who are not, and that people should be judged on the content of their character and/or their accomplishments rather than their similarity to ourselves.